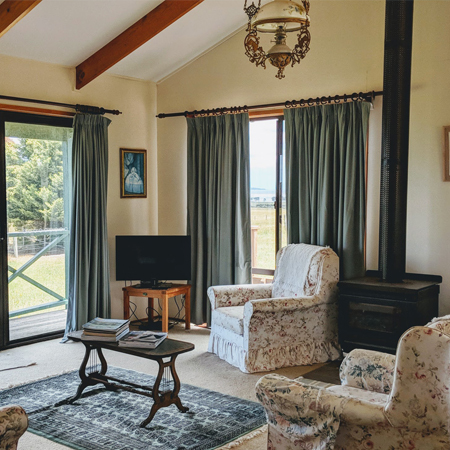 Located on the Southern Coast of French Island, you will experience panoramic views whilst staying in this self contained cottage situated in a quite location. Relax and enjoy the serenity of this retreat. Treat someone special to 1 , 2 or 7 nights in this charming cottage with fully equipped kitchen. Relax on the verandah while watching the sunset or cooking on the the webber BBQ. Coffee, Tea, Milk and Fresh Fruit included. Breakfast, Lunch and Dinner can be arranged. Fill in your day with as much or as little as you like: curl up on the lounge in front of the wood burning fire or spend the day walking on the coast, koala spotting, watching birdlife, cycling or you can take part in Naturaliste Tours 4WD Bus Adventure and explore French Island further afield. Transfers to and from the Ferry are included in this package along with your return ferry trips from either the Mornington Peninsula or Phillip Island. Pricing for this package is based on 2 persons traveling together. Single Supplement is applicable for Solo Travelers. Bookings received with only 1 passenger with no single supplement selected will be notified and / or bookings canceled and fully refunded if the single supplement is not fully paid.